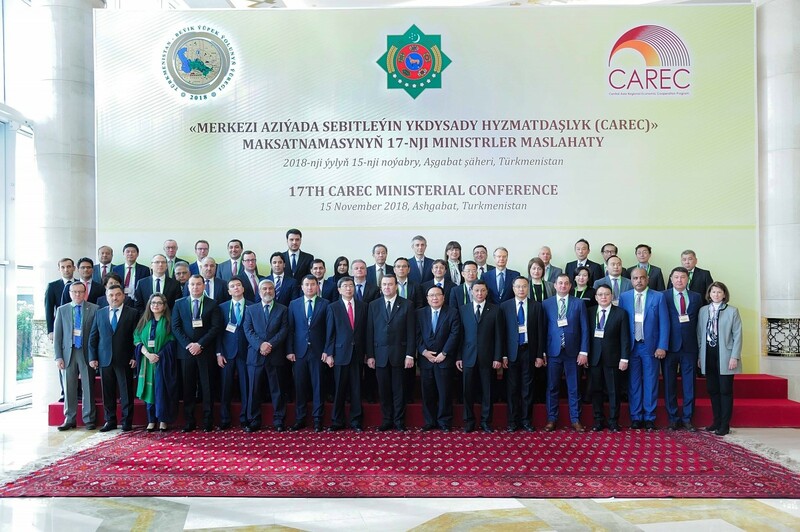 Finance ministers and senior government officials from 11 CAREC Program member countries gathered for the 17th Ministerial Conference on CAREC. Gochmyrat Myradov, deputy chairman, Cabinet of Ministers of Turkmenistan chaired the conference and committed Turkmenistan’s support to strengthening economic cooperation in the region. Asian Development Bank (ADB) President Takehiko Nakao delivered the special address. The meeting was co-chaired by ADB Vice-President Wencai Zhang. 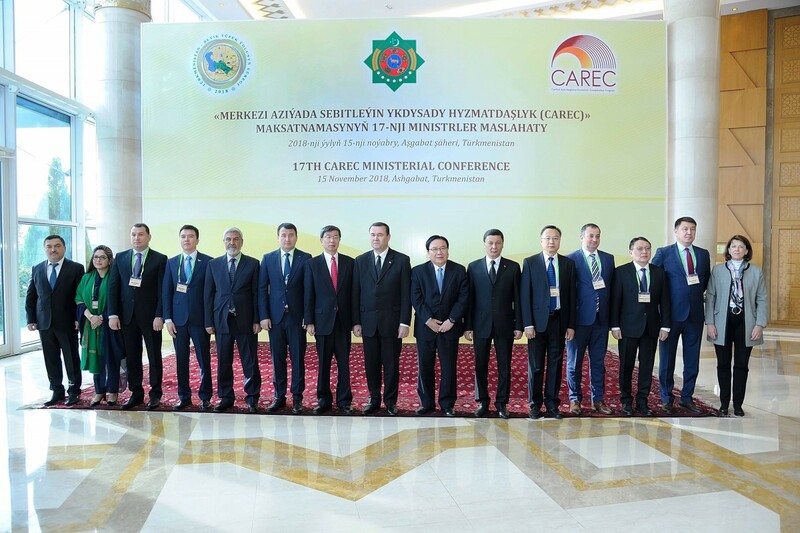 In his address, Nakao reaffirmed ADB’s support for CAREC and announced $2 billion in new assistance for regional projects in CAREC countries in 2018. The funding is the start of $5 billion in financial support over 2018–2022 that ADB committed last year to support the CAREC 2030 strategy. CAREC ministers commended the progress made in advancing the five operational clusters of the CAREC 2030 strategy: (i) economic and financial stability; (ii) trade, tourism, and economic corridors; (iii) infrastructure and connectivity; (iv) agriculture and water; and (v) human development. Ministers also welcomed the first CAREC High-Level Forum on Macroeconomic Policies for Economic and Financial Stability, and urged the continuation of such dialogue to strengthen economic cooperation in the region. Ministers supported the ongoing scoping study on exploring tourism promotion and cooperation opportunities and called for intensified efforts to capitalize on the tourism potential of the region. Ministers also welcomed ADB’s technical assistance to assess the economic potential of a new economic corridor among Kazakhstan, Tajikistan, and Uzbekistan, and noted the progress on the Almaty-Bishkek Economic Corridor. Ministers noted the importance of the aviation study completed to identify joint activities for further cooperation in this area, and endorsed a high-technology roadmap to guide member states on the adoption of new energy technologies. Also noted were efforts to promote regional horticulture trade and the initiative to set up a CAREC Food Safety Network for sharing food safety-related information. Finally, the ministers welcomed the initiation of a scoping study on opportunities for regional cooperation in higher education and skills development. From left to right: Tajikistan Ambassador to Turkmenistan Farrukh Sharifzoda; Pakistan Ministry of Commerce Parliamentary Secretary Shandana Gulzar Khan; Azerbaijan Deputy Minister of Economy Sahib Mammadov; Kazakhstan First Vice Minister of National Economy First Vice Minister Ruslan Dalenov; Afghanistan Minister of Agriculture, Irrigation, and Livestock Nasir Ahmad Durrani; Uzbekistan Minister for Foreign Trade Jamshid Khodjaev; ADB President Takehiko Nakao; Turkmenistan Deputy Chairman of the Cabinet of Ministers Gochmyrat Myradov; ADB Vice-President Wencai Zhang; Turkmenistan Minister of Finance and Economy Batyr Bazarov; People’s Republic of China Vice Minister of Finance Yu Weiping; Georgia Deputy Minister of Economy and Sustainable Development Akaki Saghirashvili; Mongolia Ministry of Finance State Secretary Narantsogt Sanjaasuren; Kyrgyz Republic Ministry of Economy’s Director of the Aid Strategy Department Sultan Akhmatov; and EBRD Vice President (Risk and Compliance) and Chief Risk Officer Betsy Nelson.